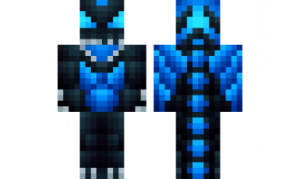 We present you one more interesting skin The Time Dragon for Minecraft pe 0.15.9, 0.15.7, 0.15.6, 0.15.4. It is suitable for young people who want to change their style for minecraft pocket edition 0.15.9. Red eyes and red bomber under them. Jeans and headphones with red inserts. It looks very stylish. Skin The Time Dragon for Minecraft PE 0.15.9, 0.15.7, 0.15.6, 0.15.4 will appeal to all young guys who appreciate style and beauty. And the image itself is very practical. For installation you will need a bloclauncher, without which we can not do without.